Fountain Pump & DC Solar Pump. DC Brushless Solar Water Pump 24V 3m3/h Submersible Pump/PV Fountain Pump 40m. Flow: 2m3/h Voltage: 24V Power: 200W Diameter:76mm Outlet: 32mm Rotation speed: 3000r/m. Built-in MPPT which can make the best use of the solar energy. The pump can be directly connected to solar panels in sunshine without controller. The pump include Over-voltage protection / Under-voltage protection / Over-current protection / Over-load protection. Environmental protection, achieve zero carbon dioxide emissions. Solved the water shortage problems of the area without electricity. Tank/Cistern filling Village or family water supply Water supply for farm Garden/courtyard irrigation systems Livestock watering Swimming pool filling Fountains Water supply for bivouac or camping car Solar water circulating system Renewable energy projects. Do not mix the positive (+) and negative (-) connection. Do not operate for long time when there is no water in the pump. The pump is submersible pump, it must be full submerged in the water. Required when the cable length is too long. How Much Watt Panel Shou I Install With The Pump? The power of solar panel configuration values suggest 2-2.5 times that of the pump power. Can I connect the pump directly between Solar Panel And Pump? Yes, But We Recomment use Fuse Between Panel and Pump. Can the pump connect to battery to work? If you just need the pump to work in sunshine, it can be directly connected to solar panels without controller. 2-2.5 times that of the pump power. If the sun is not very well, you can use more solar panels. If you also need the pump to work during the night time, or even in cloudy and rainy day, you also need controller and battery. Can you provide Controler For the pump? We Can Provide Controler For 24V type. But The price not Include The Controler. Built-in MPPT controller can make the best use of solar energy. Over-voltage protection / Under-voltage protection function? Over-voltage protection / Under-voltage protection means that the pump will stop working automatically when the voltage is too high or too low; Then it will detect the voltage every 10 minutes, and it will start to work automatically when the voltage is between 18v-45v. Item's working life is too short? We're concentrate on Motorized Ball Valve, Circulation Pump, Solar Power water Pump. All communication is handled through emails and ask a question. We strive to answer all emails as quickly as possible. The item "DC Brushless Solar Water Pump 24V 3m3/h 40m Head Submersible Deep Well Pump" is in sale since Monday, January 4, 2016. This item is in the category "Home & Garden\Home Improvement\Electrical & Solar\Alternative & Solar Energy\Solar Water Pumps". 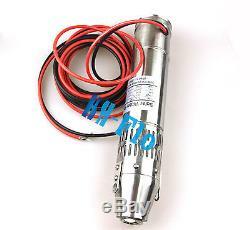 The seller is "control-valve" and is located in SuZhou,China. This item can be shipped to United States, all countries in Europe, all countries in continental Asia, Canada, Mexico, Australia.